"I have no objection to churches so long as they do not interfere with God's work." "A torpedo can't get to the Lusitania - she runs too fast." - the Lusitania's Captain Turner's response to German threats three days prior to being sunk by the u-boat U-20. Biblical authority and man concludes with this thought: the Bible is arguably the word of the one true God. Archaeological, philological, and literary evidences firmly substantiate that what we read today in the Bible is that which was written long ago. These writings are furthermore supported as valid and truthful by many fields of study including history, astronomy, geology, biology, and more. The writings indicate repeatedly and with clarity that Jesus Christ is Lord. That same Jesus Christ - the Word - is beyond question the divine authority before whom every moment of our life is playing out in grand detail. 5.2 The story of the S.S.Titanic: welcome aboard. The drama of life in the presence of the Word returns us to the ocean liner analogy with which this study began. Although the ocean liner Titanic has become a euphemism for spectacular disaster, Titanic's tragic fate was not the result of any singularly spectacular cause. The seeds of the enormous ship's doom were sown in many surprisingly subtle and invisible ways; the scraping of the iceberg being the only apparent cause at the time. The Titanic is properly remembered as a pyramid of small mistakes, misplaced priorities, complacency, carelessness, and bad judgments; all of which cascaded into a very avoidable loss of life. Consider how various sets of details within Titanic's saga curiously parallel humanity's position before God and the Bible. 5.3 The nature of the crew. Captain E. J. Smith had been wired messages by other ships about ice in the area, but he distrusted the credibility of messages delivered by wireless technology. The White Star Line's representative believed that breaking the company's previous ocean-crossing record was of greater concern than cautious sailing after dark. The Marconi operators were preoccupied with many tasks, and only forwarded a fraction of the incoming ice warnings they had received. The lookouts failed to locate the binoculars they were to have ready for their evening watch. It is easy to look back on those individuals and say to ourselves what fools they were for the mistakes they made, but many of us act no differently when it comes to God and the Bible. Like the captain, many nonbelievers distrust the Bible without even considering the facts for its case; and like the White Star Line's representative, they end up prioritizing temporal goals at eternal expense. Believers, too, have their parallels to the Titanic's crew. The lack of dedication among certain believers to their professed faith resembles the inaction of the Marconi operators. They are not sharing the message they have received with the people who need to hear it - the message of Jesus Christ. One reason believers don't share the message of Christ is that, like the lookouts, they aren't in possession of their chief tool: the basic knowledge of God's Word, something that should always be at their side. 5.4 The nature of the danger. The iceberg that lay in the ship's path turned out to be what was called black ice or a blackberg - an iceberg that had become inverted and consequently protruded clear ice up into the dark moonless night instead of the expected snowy white appearance. A blackberg is not what anyone expected to see. It was very difficult for the lookouts to spot and, by the time they saw it, it was too late. The nature of a blackberg is like the nature of Christ's return. If you are not looking, or don't know what to look for, it won't be seen until it is too late. Those who don't believe that Christ is the resurrected Savior don't expect to see him. His return is not something they're watching for. But for those who know him and do know what to look for, Christ's return is a spectacular certainty. Also consider the fact that the blackberg was not spotted because the lookouts were not looking at the ocean through their binoculars. Similarly, nonbelievers cannot spot the certainty of Christ's return because they are not looking at the world through the binoculars of Scripture. One of the specific blessings of Scripture is its ability to help us to see the certainty of Christ's coming through the fog of our uncertainties and emotions. God allows this assurance precisely so that we who believe will not be caught off guard as will those who don't expect his return (1 Thes. 5:4). When Christ does come, his sudden presence will be as undeniable as that iceberg, and the course our lives are on will determine if seeing him will be a beautiful experience or the specter of imminent disaster. 5.5 The nature of the ship. Below the waterline, the hull sections of the ship had been cast with manganese impurities many months before. Unknown at the time, these impurities result in extreme brittleness when subjected to frigid temperatures; temperatures common to the icy north-Atlantic. When the Titanic sideswiped the iceberg, the iceberg intermittently hammered or cut a pencil-thin line across the length of six water-tight compartments; compartments which, like an ice cube tray, had no water-tight tops. Water slowly began to fill the ship. Like those unseen impurities, the sinful nature we are born with taints all of us with imperfection in every aspect of our being. We may not feel weakened by sin, but those weaknesses remain hidden until we're put to some kind of test. When the icy waters of a stressful job or a stormy relationship tasks our patience, a conflict suddenly flares up. We then find ourselves saying things we didn't want to say, or acting in a manner we later regret. The Bible reveals that sin has not only tainted humanity in this way, but also all of creation. That's why it, too, will be destroyed at Christ's coming and recreated in perfection with all God's people. The collision at the bow of the Titanic went almost unnoticed in the further reaches of the ship. The ship was so large that the second officer explored several decks immediately after the collision and reported that there had been no damage. This false security that stemmed from a lack of visible and immediate damage is much like humanity's general failure to recognize that actions have consequences; specifically, that every sin brings destruction on some kind of scale, large or small. Of course, when a sin is committed, whether it be a white lie or murder, there is no lightning strike or booming voice from above shouting, "Now you'll pay!". This lack of immediate retribution is sometimes misinterpreted as an indication that neither will there be any punishment or consequence to follow. Although God is aware of what the absence of any immediate response will do ("When the sentence for a crime is not quickly carried out, the hearts of the people are filled with schemes to do wrong" Ecc. 8:11 NIV), God is a gracious and patient judge who desires that people make a full and uninterrupted testimony before pronouncing his final judgment on them. Even when one person murders another, God has no need to rush to get the offender or even to prevent the murder from happening. For God is the Supreme Creator. There is nothing that one person's testimony can take away from another that God cannot restore a hundred fold, including life and everything in it. When damage reports did start coming in, the ship's stewards were urgently commissioned to go door to door in order to inform the passengers of the situation. Though it was a time consuming process, personal contact was necessary because the Titanic preceded the advent of public address systems or emergency lights. The stewards evangelized, as it were, their gospel of the ship's condition to the passengers. Certain stewards took it upon themselves not to inform the socially less-desirable steerage-class passengers. Among the passengers who were informed, some believed and responded, but many others doubted and waited. Survivors recount that it was curiosity that initially drew people onto the decks more so than any belief that the ship was actually in trouble. The effort to alert the passengers to the ship's condition is similar to the efforts of evangelists like Billy Graham or Luis Palau, or of ordinary persons who share the gospel one-on-one. What is also similar are the variety of responses given by people when they hear of the coming day of wrath. The gospel of Jesus Christ is not always welcome news, but those who have heard the message and believed are always grateful to God for whatever measures he employed in rescueing them. The sad similarity to the ship's stewards who would not tell certain people of the ship's condition are believers who won't share the gospel for one reason or another. Out of arrogance, some believers consider themselves deserving of God's mercy and feel no compulsion to share the news of Christ with people or groups they judge to be undeserving or too disinterested in God. And out of fear of what others will think of them, or just complacency, other believers will not even share those blessings or events with which the Lord blesses them daily. Just as history frowns upon the wicked stewards who neglected to warn certain passengers of the Titanic's condition, God warns that neither will he look favorably upon believers who keep his message to themselves (Ezek. 33:5-6). 5.8 Acting on the problem. A musical ensemble gathered on deck and began playing; ragtime music interspersed with Christian hymns. The surface decks soon became a montage of every different nationality, social standing, age, religion, and gender. Some people scrambled for positions in lifeboats while others, in stark contrast, refreshed their cocktails and returned below. Against this mixed background, the first lifeboats were launched while only one-third to one-half full. Everyone on the Titanic's deck, regardless of race, wealth, education, or skills faced the same danger though not everyone realized it. All of humanity, likewise, faces the same spiritual position: each of us has sinned and, to different degrees, gone our own way instead of God's. Of course, not everyone agrees that is the case. Thus, like Titanic's passengers, everyone is making different appraisals of the same situation. Certain believers are so fixated on the coming day of judgment that they act as though having abandoned all reason and tact when interacting with nonbelievers. Certain nonbelievers, meanwhile, are so complacent about even the possibility of eternal eventualities that they scoff at the message of the cross. They're contentedly returning to their cabins of unconcern, interpreting any rising water in their lives as an aberration in an otherwise harmless world of "to each his own". Both sides, the church and the world, have problems that are exemplified by the tragic detail of the lifeboats that sailed away unfilled. The lesson for the church is to maintain gentleness and respect for everyone, preach the Word to the whole world, and do everything God commands to further his kingdom and make disciples. This includes reaching out to people who come from the "less desirable" backgrounds such as divorce, dependency, incarceration, or homosexuality - "such were some of you" (1 Cor. 6:11). The lesson for the world is much simpler: today is the day of salvation; receive God's forgiveness while he is there to receive you. 5.9 The abruptness of the end. Officers on board Titanic expected those initial lifeboats would return for more passengers once it became obvious that the ship was going down. While doubt still existed among passengers on deck, it was very apparent from the vantage point of the lifeboats that the big ship was doomed. Light could be seen flooding out of portholes beneath the waterline, and the ship's stern was slowly beginning to cantilever out of the water. The band's songs such as Nearer My God to Thee were progressively being drowned out by the screams of nearly 1,500 persons still on board; two-thirds of the ships occupants. Reportedly, one lifeboat officer commented on refusing to return his boat to rescue more passengers, "It's our boat now, not theirs". Multiple boiler explosions and the screeching of tearing metal tearing eclipsed the pandemonium on deck. Very quickly after this point, the ship disappeared below the surface of the water and began its irreversible descent to the bottom. There comes a time in life when it is too late to take a certain course of action; a time when opportunities are lost and there are no more second chances. The opportunity to follow and serve God is right now and continues until the moment of your death. The importance of taking advantage of this opportunity might not be appreciated by those unfamiliar with humanity's position before God, but from the perspective of being in the Church, the world's desperate need of the Lord is very clear. One matter of great concern today is a growing complacency about ungodliness - both outside and inside the church. Seeing complacency in the unsaved world is like watching people partying on the ever-increasing tilt of the Titanic's deck; people oblivious to the rising waterline. But seeing complacency inside a church is as angering as seeing sparsely filled lifeboats not bothering to return to save additional passengers. "What did you do for those you left behind?" the rescuing ship's captain likely asked those of the lightly filled boats. "What did you do for those you left behind?" God may similarly inquire of believers at the judgment. 5.10 The living and the dead. For the next thirty minutes or so, the surviving lifeboats were engulfed in the sounds of weeping and screaming in the near total darkness of a moonless night; a darkness pierced only by weak lanterns from the lifeboats. Survivors scanned about, desperate to know "Who made it?" Then, there was only silence and darkness and cold. The next few hours probably passed like an eternity. As dawn approached, the weak lights of the lifeboats waned in the greater light of the morning sun. Once in full light, it was the survivors' fears which waned with the beautiful sight of an approaching ship - the Carpathia. When the Carpathia picked up the lifeboats, only a scant one-third of the Titanic's inhabitants had survived. Thanks to their survival and their sharing of the preceding details, the world would have yet another opportunity to learn from the past. The end of the world which the Bible describes is so similar to this final scene that a detailed comparison almost need not be made. Substitute icy waters with what the apostle John described as a lake of fire and all the essential elements of the last day are right there. The great, dawning light of the world is Jesus Christ. He comes to seek and to save us. This light from him is the light every believer has been given to reflect. But even the best of our reflections will pale in comparison to his goodness once he appears in his fullness over the horizon. At his coming, everyone will be judged, but the lost and the saved will be eternally separated. For the unbelievers, there will be the tragic irony of being sentenced to live as independently of God as they had lived on earth. Only they will finally see that God had been the source of all the delight, contentment, and good things that they had been seeking everywhere but in his companionship. For the believers, their excitement is described by the Bible as that of a bride or bridegroom on their wedding day. Though the quality of each believers' work will be tested, the fright of judgment will end with God forever wiping away their tears and welcoming them into a union with him that will never end. 5.11 The sum of humanity's best efforts. Did humanity learn from the lesson of the Titanic? Well, only a few short years after the Titanic's sinking, there were assurances that no disaster of that magnitude would ever happen again. Someone made the fateful comment that although the Titanic had been nicknamed "Unsinkable", the truly unsinkable ship had been crafted thanks to lessons learned and to engineers' improved efforts. The name of that ship was...the Lusitania. Fast forward in time to May 7 of 1915: Lusitania's lifeboats did little good as that ship sunk in eighteen minutes. Although the Lusitania's antagonist was not an iceberg but one or two torpedoes from a German submarine, Lusitania's story is an amazingly similar pyramid of inconsequential actions and decisions which all added up to disaster. Of the 1,962 passengers and crew that set sail from New York, sailing in spite of advertised German warnings that any British or allied ship approaching the English Channel would be sunk, only 764 survived. The Lusitania's addition to the Atlantic floor eased the suffering of Titanic's victims in much the same manner as some believe there is comfort in going to hell with their friends - no comfort at all. And the Lusitania's permanent exile to the sea bed reinforces the same lessons that should be learned from the Titanic: the need to see, recognize, and avoid the dangers of arrogance, complacency, and misplaced security. For you and me, the lesson is a spiritual one. We must see our need to obtain the forgiveness, power, and guidance of God, recognize that Jesus alone has accomplished this for us on the cross, and believe that his loving sacrifice has saved us from condemnation and has brought us into an everlasting relationship with him. 5.12 We have a responsibility. As was the case for the Titanic, a large part of the responsibility for seeing that everyone hears of the free gift of eternal life through belief in Jesus Christ lies with the stewards. This is because salvation begins with the Holy Spirit who draws people to God; and it is largely the people who desire and obey God and who are filled with God's Spirit whom the Spirit will use. Those loving, obedient, Spirit-filled believers are the good stewards. Each good steward needs to be the vigilant watchman that God has commissioned him or her to be. They must not be forgetful of their preparedness, but be familiar with the Word that will make them "thoroughly equipped for every good work," (2 Tim. 3:17b). They must remember to view the world through the binoculars of the Scripture rather than trusting their own imperfect eyes, and persistently proclaim the good news of Jesus Christ; if not door-to-door and cabin-to-cabin, then just by the silent but powerful testimony of godly living. Followers of Christ are also to share the Word with everyone; never presumptuously judging who deserves the gospel and who does not. They are to remember that their particular church and denomination do not belong to them, but to God. The believing churches and denominations are God's appointed lifeboats which must always be prepared and willing to receive the lost. This should be easy to remember for there is no one in God's church, save for God himself, who did not get there by first stepping off his or her own ship of unbelief. The Word is the glorious presence of God. May every reader who opens the Word hear the Master's voice in every passage. For there is no greater authority, no greater confidence, no more blessed assurance that one can have than knowing through the Holy Bible, God has spoken. By this point, everything that needs to be said has been said. So instead of saying it again, here is a comparative analogy based on a compelling historical account: the true story of the S.S. Titanic. Within the many details of this account are very important lessons for both skeptics and believers. 5.2 Welcome to the Titanic. 5.3 Nature of the crew. 5.4 Nature of the danger. 5.5 Nature of the ship. 5.9 Abruptness of the end. 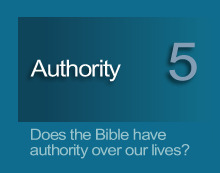 the Bible is to be believed; it has authority over our lives.